Writers of the future will be information managers. Known as Voight-Kampff, the operator would connect to the platform and challenge the data he had been working with for several months. The process and the tools below describe how he produced a so called work of fiction. By accessing this multimedia platform, 1) the promoter will be able to explore their research field 2) the operator will mine the data generated by respondents 3) respondents will share their experience with operators. The platform will help you manage a virtual community, identify major outputs and ultimately understand major issues and concerns within your researched field. For a number of reasons, not all exposed here, we called this platform, Illumination (TM). At each stage of the research, the operator will handle the appropriate tools required for his project. Three main menus will be displayed on the dashboard: 1) the moderation menu, 2) the data management menu, 3) the analytics menu. Each of these could be used by multiple operators and support multiple languages. One will need to stimulate, entice, facilitate in order to create the context which will enable feedback generation. The moderator is not just an operator, he is a facilitator who will encourage and nurture involvement and sharing. Within the platform, respondents will express themselves not only as individuals but also as members of the community. The feedback obtained should be read at these two levels. In order to comprehend the community, the operator cannot remain in the shoes of a mere interviewer. He must, as overt researcher, unveil his role and objectives and then mingle with respondents to intimately grasp the behaviours and practises of the observed group. He must generate debate, exchange opinions and become a congenial intruder at worst, a well-accepted member at best. Elements of gamification will spice up daily activities and will increase engagement and loyalty within the community. Here are a few examples: attributing bonus points for most responsive participants ; allowing fancy and meaningful avatars ; authorising the upload of fun pictures and videos when responding to some tasks ; organising time-based games and quizzes ; implementing questionnaires based on problem-solving or projective techniques. Qualitative, quantitative, hybrid, synchroneous or asynchroneous, data collection is actually very straightforward owing to the versatility, speed and depth of the system. A distinction should be made between rough and screened data. The unfiltered database aggregates the responses, interactions and queries from the various applications or tools available in the system (forum, multiple-choice questionnaires, chat, diaries, etc.). No matter the task or methodological approach, the operator can easily collect, tag (by day, by respondent or by type of stimulus), share and index data in multiple ways thus creating satellite databases or sub-datasets in order to further refine a search or deep dive into a more specific theme. At any time, the operator can extract data from the main database and proceed to further coding, merging or analysis depending on his own intuitions or new hypotheses he would like to validate. Possibly the trickiest step but also the most essential one. Through coding, the operator will "own" the data but also start to shape things and find a structure and a meaning to it. Almost each piece of feedback will be attributed a code, a value and a weighting (in terms of sentiment for instance). All of these coded elements will help the operator manage the information and create significant groupings or identify trends which will enhance specific conclusions. Defining codes is both prospective and retrospective. 1/ Prospective: At launch, analysts in conjunction with promoters may define a number of dimensions, themes or hypotheses that are of special interest or will help clarify some issues. These initial themes, albeit limited, can be biased by operators' subjectivity and need to be re-evaluated during the course of the research and at the end of the project, prior to final analysis. 2/ Retrospective: as data gets collected, the operator will screen the information in order to check that predefined themes are relevant or if new ones should be created. These themes, prospective and retrospective, will structure the entire coding process. A range of statistical tools are available to the researcher to derive a number of analytics. Some preliminary statistics may provide a number of respondent segmentations (socio-economic profiles, ethnic origin, age range, current medical treatment, etc.) as well as engagement data (number of interactions, volume of participant feedback, average connection time, etc.). 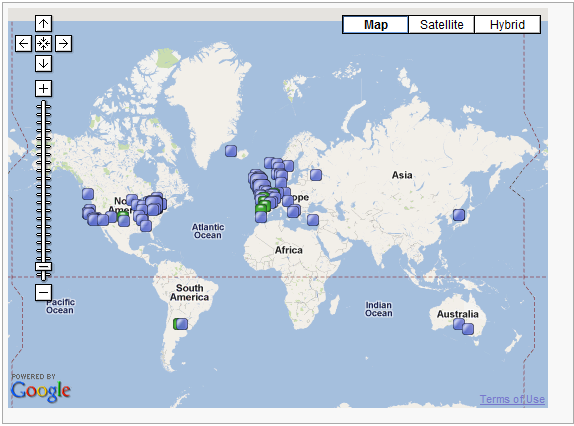 The map below indicates the geolocalisation of participants. So as to segment participants, a number of Key Profile Indicators (KPI) have been defined: involvement KPI, leadership KPI, lethal KPI, etc. Involvement is provided to target those respondents who are the most involved or engaged within individual and group activities. Leadership is an important indicator to identify and gauge the most influencing respondents who might bias or alter the nature of some of the discussions in group activities. As for the Lethal KPI, it will help assess aggressiveness and, should unbearable levels might be reached, it will indicate if an individual is becoming harmful and should be excluded. All of these KPIs are control tools which assist the operator in the management of the respondents and in the treatment of information. 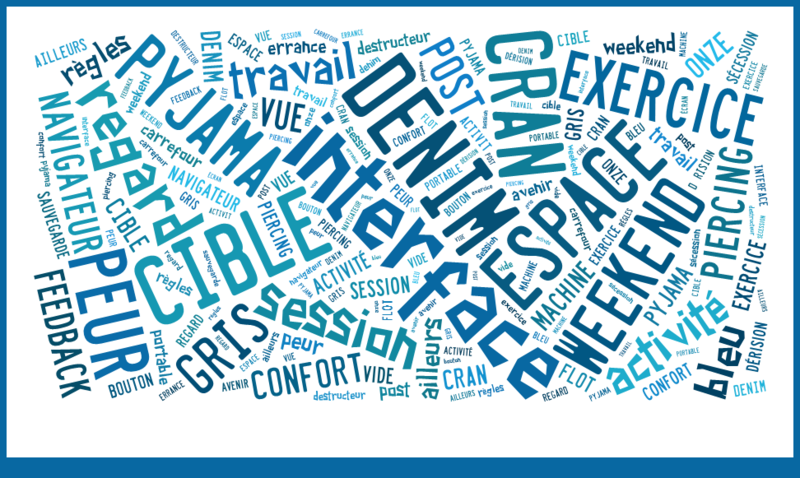 The operator has produced a number of word-clouds based on some of the interviews undertaken with respondents. What you see below are actual portraits, pictures of men and women reduced to their statistical imprint. During the analytical process, the operator will use some of the system's algorithms and be able to structure the respondents' feedback into sequences. Layers of verbatim can thus be displayed and arranged by the operator. Sequences provide a meaningful and in-depth approach to key themes, iterative discussions, shared issues . These sequences may be compared to leitmotivs. Note that the system may also identify atypical sequences, that is feedback which cannot be indexed by the algorithms. Indeed, symbols, graphorrhea and unreadable components will be automatically collected into a separate database. The operator can further explore these with more elaborate deciphering tools which have been integrated in later versions of the system. Most feedback has to be arranged in a significant manner. The operator, at the pre-reporting phase, has to select relevant data and decide upon the structure and final grouping of information: thematic, chronological, morphological, etc. The feedback can be handled as pure respondent verbatim, can be synthesised into analytical strings or integrated into a clearly exposed demonstration. Most importantly, as is now the trend within this field, data should be storylined and delivered as a cohesive stream of text. thus allowing an easy overview and facilitate retention of key events. The output is supposed to reveal major intuitions, support hypotheses and somehow reflect the operator's vision. This technology has been successfully used for a number of years. Cases of dysfunctional use have been described in the literature. This was the case of the Black Box Report published in 2013. The project, carried out by the operator Voight-Kampff, suffered major methodological flaws and the final results were rejected by the promoters. The current version may indeed be disqualified for a number of reasons, some even contradictory: pre-eminence of automatic processes ("too algorithmic"), biased structure of information ("too loose and disconnected"), lack of relevance in the outputs ("who is speaking? "), totally unrealistic hypotheses and sheer absurdity in the conclusions. This version is currently deemed to be non-official. As the promoters explained: "this has nothing to do with our research objectives, this is pure fiction". 1. As you probably understood, this book is a pretext. It is up to you to package it, shape it the way you please and find the structure that makes more sense to you. 2. In the above sections, replace the word "operator" with the word "writer" to convey some of the choices encountered by Mr Voight-Kampff. 3. In the above sections, replace "operator" with "content manager" to reflect the actual job that Mr Voight-Kampff has attempted to perform while handling massive amounts of incoherent verbatim. 4. You would believe that this was a kind of interactive piece. It is not. This was the result of the struggle between a man and a machine. 5. How do you read data? You don't. 6. 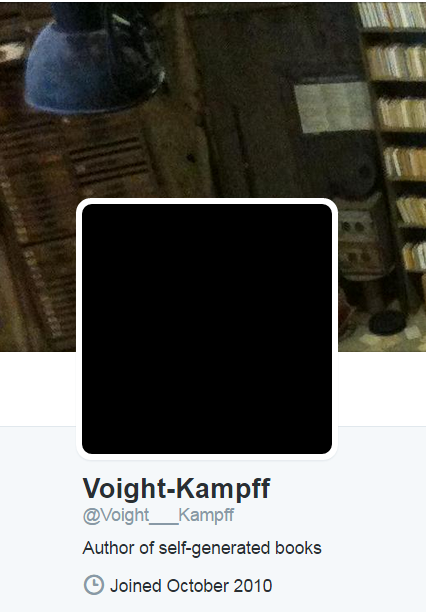 Delete the name Voight-Kampff from the initial report. Delete his ghostly presence from the book. What is left is the algorithm forever rearranging the data into millions of different stories. Constraint, concept, authorless writing, free style and self-generated textual materials. Most of the time, I do not produce, I let things happen.